The study on "Technological constraints of canal irrigation system of coastal command in Kendrapara district of Orissa" was undertaken to find out the technological constraints of canal irrigation system by water users. An attempt was made to secure their responses about judicious use of canal water and to identify the various technological constraints perceived by them about canal irrigation system in the area of investigation. Kendrapara Block and four villages in it, were selected purposively, whereas the respondents were selected by random sampling method. The major findings of the study were: (1) ninety one percent of the farmers opined that excess and shortage of canal water to plots in close proximity and those at a distance from the irrigation channels (2) lack of irrigation responsive varieties. (3) The requirement of water at critical stage of growth is inadequate,. (4) water management in nursery bed difficult due to scarcity as well as excess of water. (5) alternate irrigation is not possible. (6) soil reclamation is not possible. The most important suggestion given by the respondents was canal water should be released at the time of requirement. Abernethy.C.L. (1986): “The performance measurement in canal irrigation water management a discussion”Irrigation Management Network Overseas Development Institute UK/No. 86. Dutta. S.K and Chang B.W (1986): Under utilization of canal irrigation in some command areas of Bihar. Agricultural Situation in India 41(8):615-622. Agro-economic Research Centre, Visva Bharati, Santiniketan, W.B. 713235. India. Mishra. B. (1988) Socio-economic constraints irrigated agriculture of Orissa. National workshop in Socio- economic constraints, on irrigated agriculture. Rath and Dash (1988) “Socio-economic evaluation of Mahanadi Delta irrigation project”. National workshop on socioeconomic constraints in irrigated agricultural land. pp. 21-29. Skogerboe.G.V. (1982) Development process for improving irrigation water management” Water Supply and Management 6(4). 329-342. Subramanian, P. Purushottaman. S. and Pechiappan. 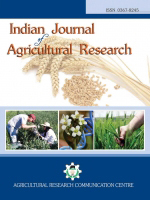 S. (1992) Irrigation management for ratoon sorghum Indian Journal of Agril. Research. 3 May pp-8-10.